The battle we face is not a physical one. 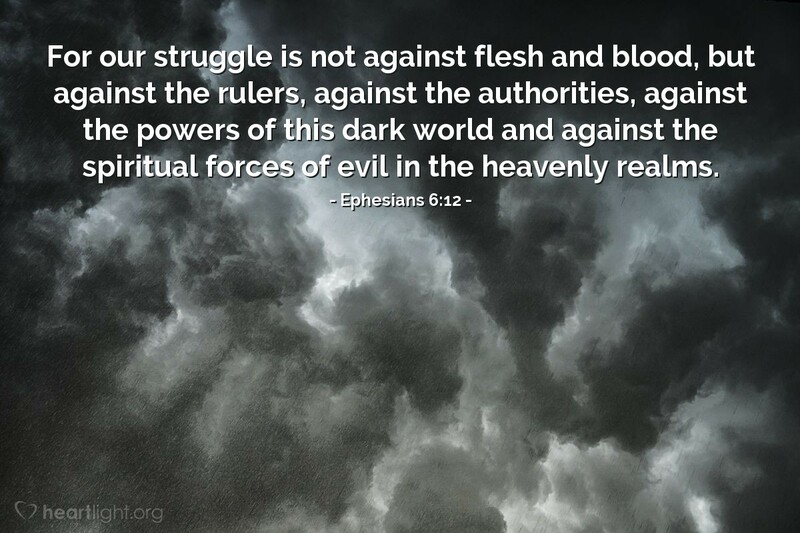 Instead, it is a spiritual battle with powers that we do not easily see and which are very powerful. We shouldn't dismiss this as an imaginary battle or as an irrelevant struggle. Just as clearly as Satan was crouching at Cain's door, desiring to have him, so he crouches at our door (Genesis 4:7). He will use his forces of evil to do all he can to defeat, destroy, or corrupt us. We must take this war seriously and recognize the spiritual power of our foe. Father, forgive me for the times I have not taken the threat of evil seriously. Give me a holy revulsion for anything that is tied to what is unholy and opposed to your work and will. Let me not be deceived by temptation and deliver me from the power of the evil one in all of his forms. In the mighty name of Jesus I pray. Amen.